Training camp is drudgery for players, and so it shouldn’t be a surprise that as training camps opened, several players decided finally to retire. Coincidentally, all four of the retirees during this time period were wide receivers. Below are some thoughts on the careers of these receivers; you can see how they compare to other 2010 retirees in this post. David Tyree, Giants – Tyree’s helmet catch in Super Bowl 42 is one of the iconic catches in NFL history, and it was also the last grab of Tyree’s career. Better known as a Pro Bowl-level special teams player, Tyree played five seasons for the Giants before an injury shelved him in 2008. He returned to play 10 games on special teams for the Ravens last year, but Tyree wasn’t signed in the offseason and so he signed with the Giants to retire with the team. He’ll be a Giants legend for one play, and that’s not a bad legacy to leave with. 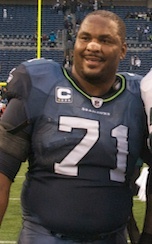 Ike Hilliard, Giants – Hilliard, who last played in 2008, spent 11 seasons in the NFL, the first seven with the Giants after the team picked him in the first round of the 1997 draft. Hilliard then had a nice second act to his career with Jon Gruden in Tampa Bay. Hilliard was never a No. 1 receiver, but he was productive in tandem with Amani Toomer for many years, and he ends his career with 546 catches for nearly 6,400 yards with 35 touchdowns. That’s a nice return of investment for the first-rounder the Giants spent on him. Sean Morey, Seahawks – Morey, who signed with the Seahawks in the offseason, made his living as a special-teams dynamo. He made the Pro Bowl in 2008 and was on a Super Bowl champ in Pittsburgh and a runner-up in Arizona. The Ivy Leaguer had just 11 career catches, yet he played seven full seasons after playing just two games between 1999 and 2002 at the start of his career. That’s a big statement on his value. Morey retired because of repeated concussions, and any player who has struggled with concussions needs to read what Morey told Peter King. David Patten, Patriots – Patten started his pro career in the Arena League, but he fought his way onto the Giants and into a 12-year career. His best days came with the Patriots’ three Super Bowl winners. He even became an NFL oddity by throwing a touchdown, receiving a touchdown, and running for a score in the same game back in 2001. Patten finishes his career with 324 catches for 4,715 yards and 24 catches, and Bill Belichick’s respect, which says even more about the way Patten prepared and played.